How many pumpkin pie posts are too many? None I say! Especially when it’s Thanksgiving time again in Canada! A few years back I wrote about how I attempted to make pumpkin pie the old fashion way, and in the end found the Cooks Illustrated recipe with a can of pumpkin purée and a can of candied yams to be the best. 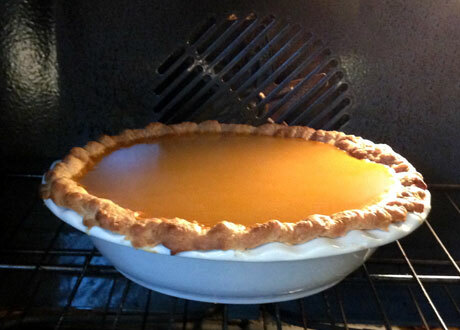 So I dusted off my pie pan and got to work for this year’s Thanksgiving dinner with foodie friends. Everything went swimmingly, but I found that blind baking the pie crust until golden brown led to slightly over-baked crust edges when the pie filling was baked. And I didn’t follow my own recipe closely enough this year and failed to simmer down the purée enough and tried to speed up cooling of the pie leading to a slightly wetter pie when we served it. Oops. The day after Thanksgiving we all awoke with a longing for more pie, and as I had enough pie dough left, I gave it another go. This time I let it simmer longer, only half baked the crust before adding the filling, and let it stand for a few hours to let it really set up. The result? A silky smooth pie. Delicious. Here’s a link to the post with the recipe so you can give it a go yourself. Let me know how it turns out. A collection of recipes and tips that will convert you to food worship. "How many pumpkin pie posts are too many? None I say!" "FUEL addresses four sectors of innovation, Design, Technology, Sustainability, AND FOOD!" "Recently I set out on a 30 day health challenge. It was called [Whole30](http://whole30.com/whole30-program-rules/). The whole point was to only eat whole foods for 30 days and see how my body reacted." "I want to share one of Russia's most beloved recipes, a New Year’s Eve dinner staple known to everyone in countries of the former Soviet Union." "Koryo Saram cuisine is a unique blend of Korean, Russian, and Central Asian flavours… their food remains as one of the few unchanged cultural elements." 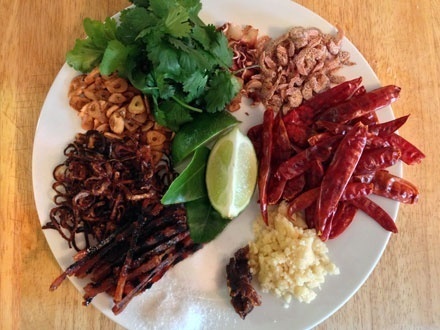 "I was completely hooked the first time I tasted Jaew Bong and knew I had to figure out how to make it at home." "Moving east has its perks, including this totally delicious oily fish, which are fished in the winter through holes in the ice. It’s a local and sustainable fishery." "To be in Provence in the fall is to be surrounded by incredible amounts of grapes, and this recipe is a fabulous way to use those grapes." "While in Halifax, I had a chance to eat at the [Wooden Monkey](http://www.thewoodenmonkey.ca/), a local institution that serves totally delicious food in a cozy environment." "Lauren Mote and Jonathan Chovancek are the co-owners of Kale & Nori Culinary Arts, and makers of Bittered Sling Extracts. We had to share their amazing recipe for Turchetta."